Often bluegrass is categorized as folksy acoustic music, safe for a quiet night with the family out on the farm. 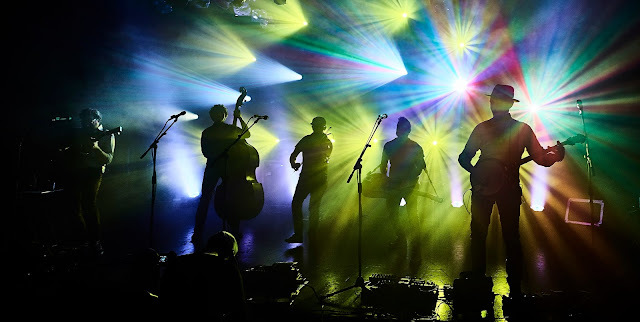 And then a group like the Infamous Stringdusters comes along and reminds you that modern bluegrass is anything but that outdated perception, and attending a live show may require earplugs, goggles and steel-toed shoes. Minneapolis natives The Last Revel kicked off the evening with a set that was impossibly vibrant from such an unassuming trio. 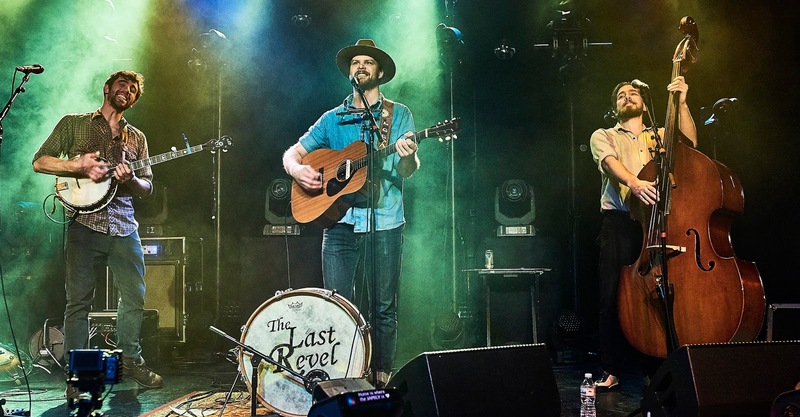 With minimal production (and a wardrobe that was proactively Midwestern), the group built on traditional bluegrass with every sound they could think of among the three. When violinist Vincenzio Donatelle was not on bass, the lowest sounds were filled in by lead guitar and vocalist Lee Henke nonchalantly operating a kick drum. In turn, Henke and banjo player Ryan Acker switched instrumental roles from song to song. Henke added harmonica to his stringed instrument where appropriate. And everyone sang. The Last Revel is at least a seven piece band rolled into three mortal men. 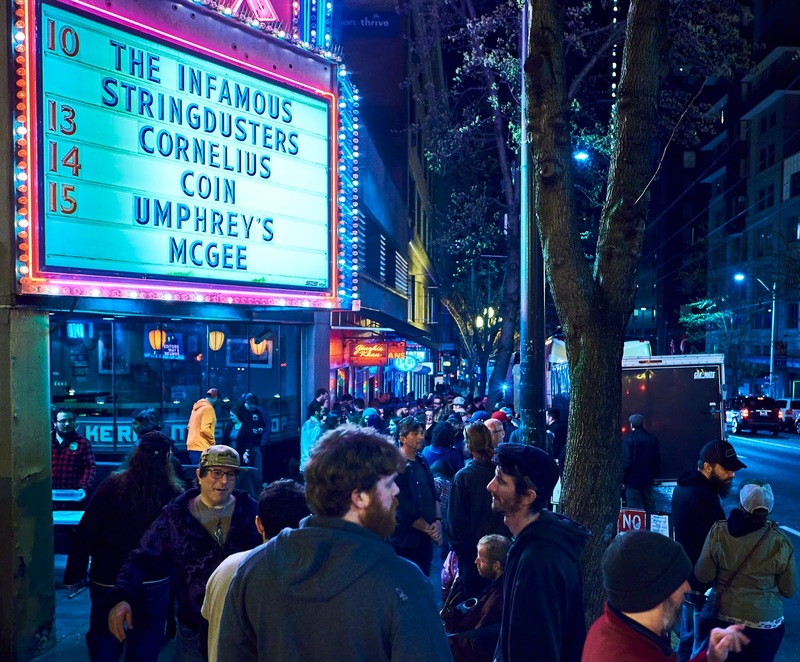 The Showbox had become pretty full of heel-stomping fans by the time The Last Revel left the stage. The Showbox, situated near Seattle’s famed Pike Place Market, is a mid-century-ish understated deco ballroom, with elevated bar areas in the back corners of the room, built for dancing. If you’re over 5’ 5”, there is not a bad view in the house. Fresh off their Laws of Gravity GRAMMY Awards win for Best Bluegrass Album, the Infamous Stringdusters were flying high from the moment they stepped onstage. It was their last show of their tour. More than a few people positioned in the front row had been on the road for multiple Stringdusters shows, and the divide between the stage and the dance floor felt like just an administrative detail. We knew we were all going to get down together. 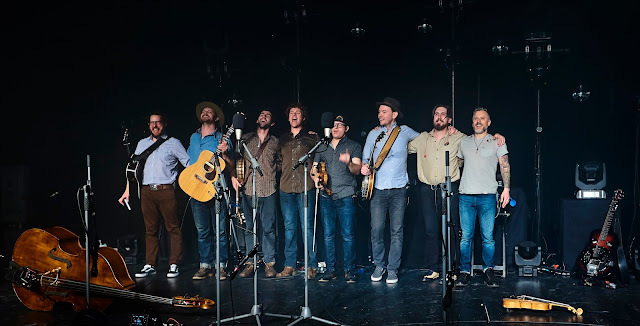 Stringdusters created a perfect arc of energy over the course of the evening, starting strong with “Hobo Song” and “17 Cents,” each band member happily weaving around the stage. It seems like nearly every band member sings on nearly every song, and perhaps it is this ubiquitous attention to vocals (without eclipsing the instruments) that engages so many fans. The tune “This Ol’ Building” let out a bass line that delivered a bit of a classic rock feel, and employed some beautiful violin effects. The songs of the first set built all the way to a crowd-tickling cover of Phish’s “Possum,” and I am pleased to report that the floor did not break, though it was touch-and-go for a minute. After a well-deserved set break, Stringdusters resumed the show with a few of their standards before quickly poking the (friendly) bear of a crowd with a lengthy tease of Phish’s “Bathtub Gin.” The band members moved around the stage and around each other more than most bands, and certainly more than any comparable bluegrass band. They were enjoying each other and they were enjoying the crowd. It was hard to tell who the actual “frontman” is, which is perfectly fine and quite admirable. Stringdusters were showing off the smooth, steady feel of their musicianship over a few more songs before they unleashed another rager in the form of a surprisingly danceable “Super Mario Brothers Theme,” which was immensely appreciated by attendees aged 30 to 45 (and was moderately confusing to everyone else). The show closed with an appropriate end-of-tour blend of originals and classic covers. 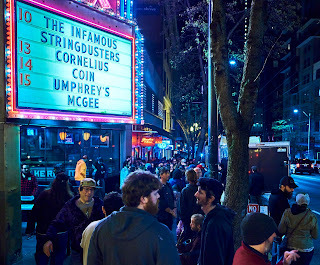 This night was a perfect ending to the Stringdusters’ GRAMMY victory lap. And next time I will be prepared with protective footwear.